I consider abstraction to be the only freedom I have in this life. I have created a virtual world that I inhabit in a dreamlike state. It is at once emotional and egotistical, with its own logical and imaginative dimensions. All appear in the mixture of semi-representational or non-representational elements like Islamic ornaments. Abstraction, whether geometric or not, gives me a vast space within which I can express myself without boundaries. 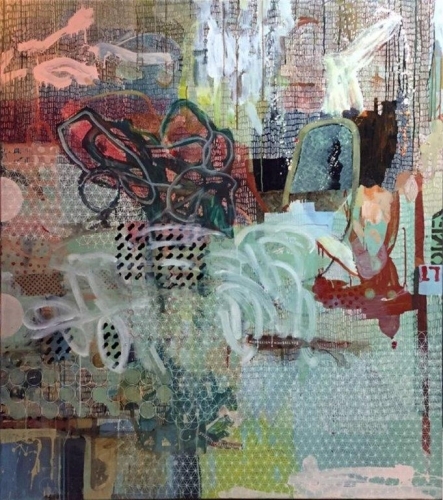 Simultaneously, it allows my viewers an opportunity to freely imagine and interpret the semi-representative forms, ornaments, scratches, textures and colors individually. 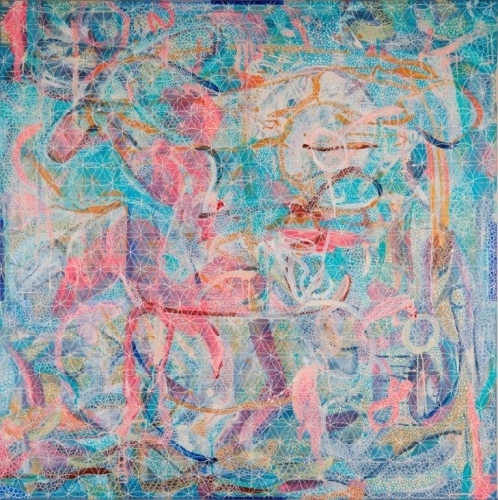 However, I am inviting my viewers to feel the poetry and music that appear in their own aesthetical norms, traversing the large philosophical questions, and delivering “timeless” and “globally” recognized symbols, with full freedom, without the obstacles of culturally or historically related representational elements. 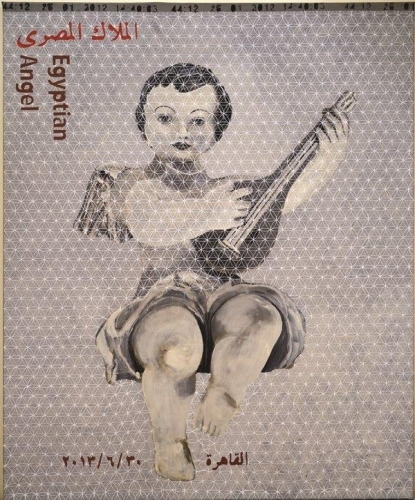 Hazem Taha Hussein (Born 1961, Egypt), currently is working as an associate Professor of visual communication design – Faculty of Applied Arts, cairo – Egypt. 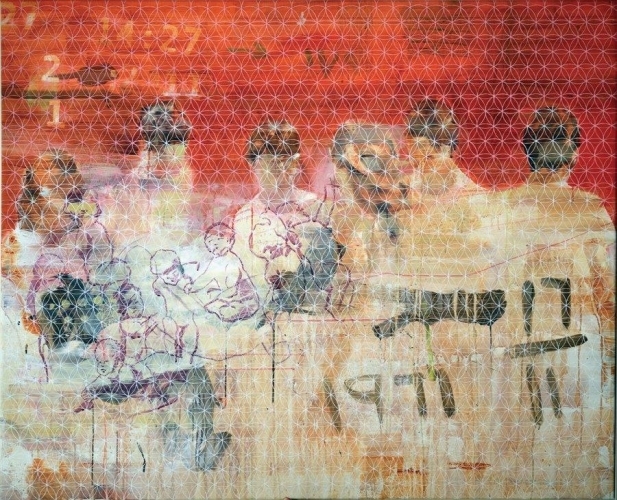 Hazem T Hussein is a pioneering Abstract and conceptual visual Egyptian Artist from the 5th Generation of the Egyptian Contemporary Art Movement. 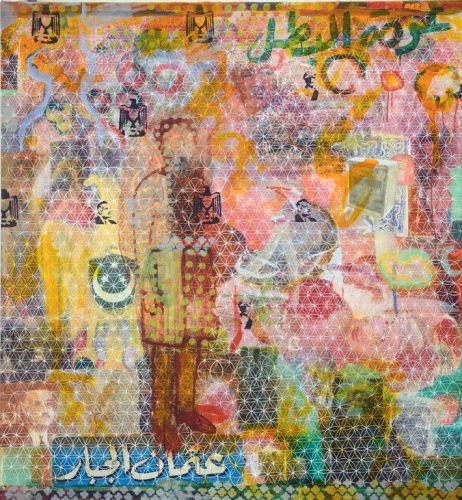 Hazem Taha is notorious for his unique composition technique. 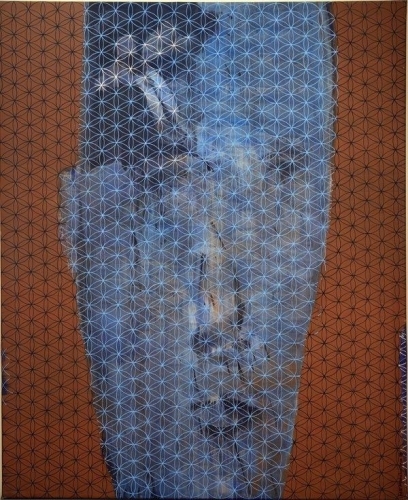 He builds his work by overlaying Islamic patterns or motifs on the background, in an effort to obscure or hide his abstract figures. Starting with the painting or drawing of figures, faces, or angels, he then covers them with paint, followed by plain areas. 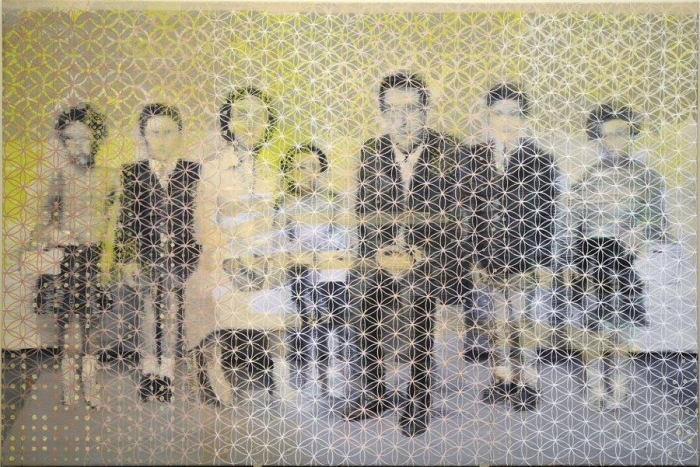 He finishes the work by superimposing over the entire surface, repeated and interlacing Islamic patterns or ornaments that he is fond of. The result is an optical illusion similar to a photograph. It shows a profile that is never motionless before the eyes, but constantly appears and disappears. 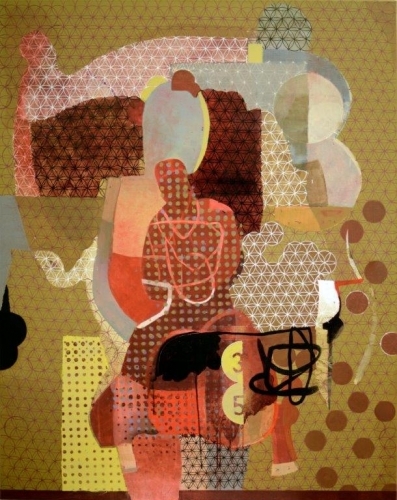 The patterns superimposed on the figures create a sense of fluidity, movement and change. The last layer with its repeated patterns is the most interesting. It resembles the repeated typically found in Mosques. This effect forces the spectator to stare at one point at a time. This view is fluid and will change at different times and at different state of emotions, leaving the viewer to endless interpretations and different perceptions and each time uncovering something new. 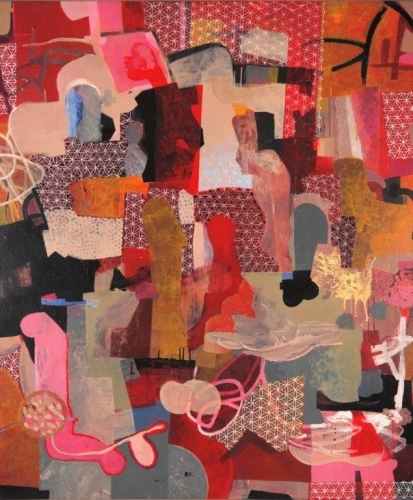 Therefore Hazem Taha, a neo-expressionist painter, has succeeded in combining western and eastern elements in his paintings to produce forms for the spectator to interact with and to relate to, thus evoking some visual dialogue. 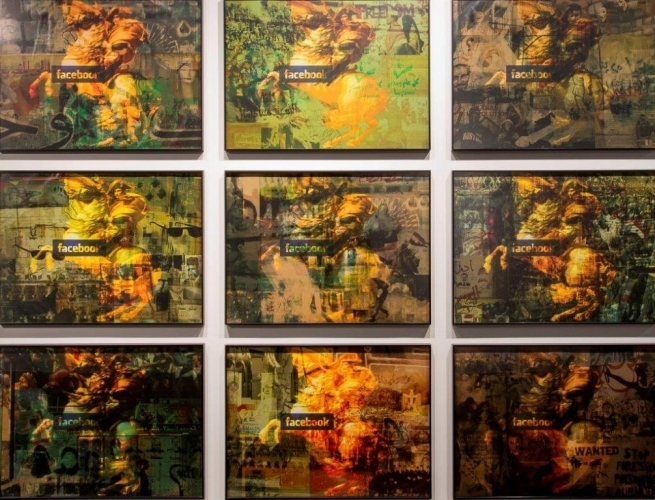 The works involve the spectator in a dialogue questioning the meaning about rather than the perennial appeal. Since the early 80’s Hazem Taha has been working as an artist, designer and teacher of visual communications design in Germany, Egypt and now in Bahrain. 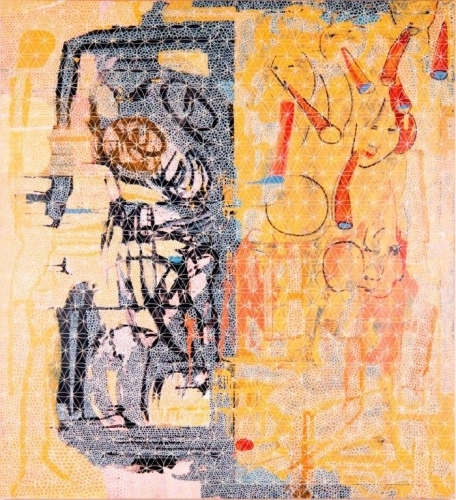 After developing the series of “Stick figures and portrait ghosts” in 1987, Hazem moved to Basel in 1988. 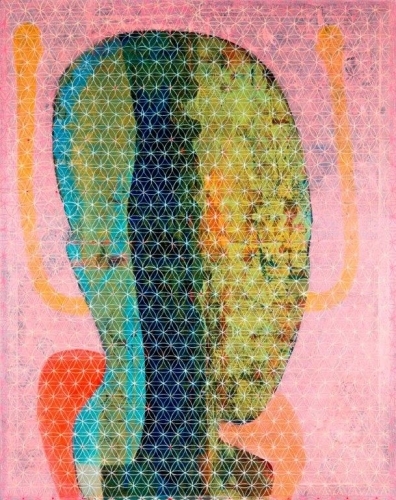 This was the beginning of a series of new works whereby the paintings started to be superimposed with repetitive patterns. 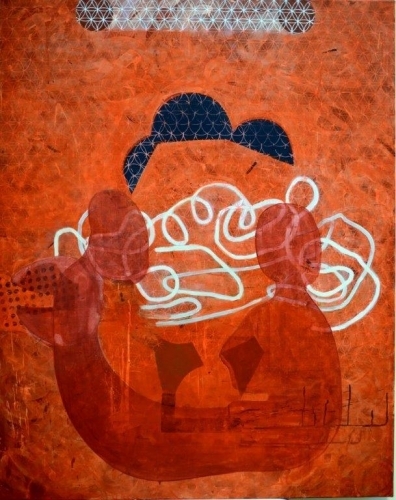 In 2000, Hazem continued to compose his works by the Juxtaposition of patterns leading to his own series of Omar El-Khayyam (A one man exhibition showcased at Space cream Art Gallery in Cairo). As he said, Hazem was inspired by his parents who are both artists. 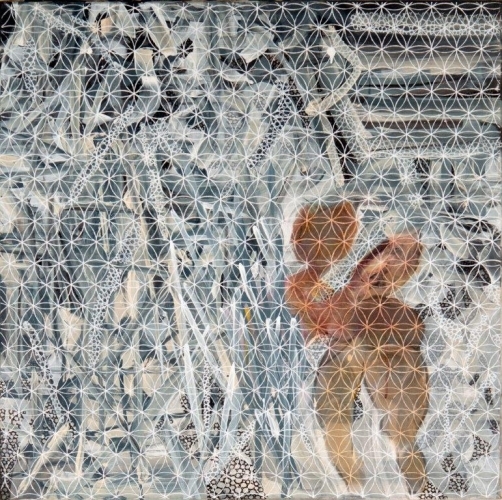 He learned from his father the importance of building layers while constructing a painting and he learned from his mother the technique of painting abstract figures in a dynamic or three dimensional perspectives. He has more than 80 products and public art projects in Africa, India and many other European and Arab Countries. 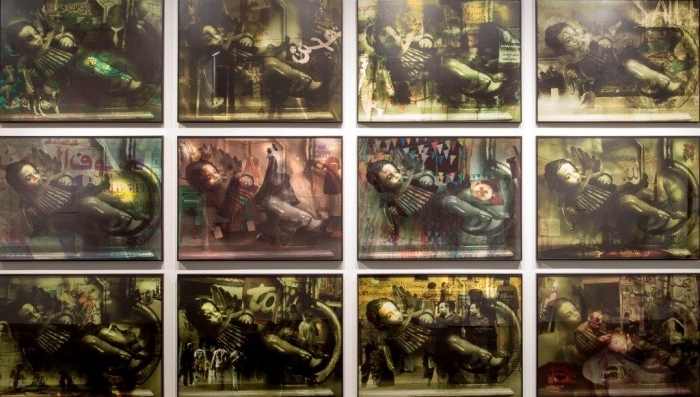 He has been involved in Photomontage exhibitions in Cairo, Marseilles and Bonn, as well as painting exhibitions in various European countries, such as Sweden and Spain. FotoFest Biennial, Abo-Dhabi, UAE, 2015; FotoFest Biennial, Houston, USA., 2013; Land of the Hyperreal: Contemporary Art from Egypt, Havana, Cuba, 2010; What Happening Now?, Casa Arabe, Madrid, 2010; Triogie Méditerranéenne: from Athens to Marseille to Cairo, Palais de Arts, Marseille, France, 2008; What happening now: Art Palace, Ministry of Culture, Cairo, Egypt, 2008; The Present Out of the Past Millenia: Contemporary Art of Egypt, Kunst Museum Bonn, Bonn, Germany, 2007; Occidentalism: The West on the Eye of Egyptian Artist, Swiss Hotel, Cairo, Egypt, 2007; The Baggage, Alexandria Atelier, Alexandria, Egypt, 2007; Father and Son, Mohamed Taha Hussein and Hazem Taha Hussein, French Center, Alexandria, Egypt, 2006; Egyptian Artists with M. Abla, A. Nosier and others, 21 Art Gallery, Dubai, UAE, 2005; 1st Book-Biennale, Bibliotheca Alexandria, Egypt, 2004; Huruf: with H. El-Zani and H. Lotfi, La Bodega Gallery, Cairo, Egypt, 2002; Egyptian Art: Kunsthalle, Stockholm, Sweden, 2001; El-Nitaq Festival, Cairo, Egypt, 2001; Market Fair, Noteln, Germany, 1996; 8 Egyptian Artists, Kunsthalle Augusburg, Germany, 1990; Egyptian Young Artists, Oman, 1989. Chr. Marian Stiftung’s Fellow, Basel, Switzerland (1988): Fellow of Egyptian Ministry of Culture (2003-2005); DAAD Fellow (1990-94) and Visiting Professor (2005). 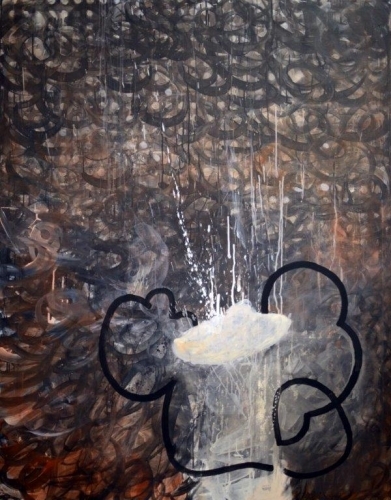 Inner Dialogue, Al Masar Gallery for Contemporary Art, Cairo- Egypt, 2017 – Shut Off, Al-Bareh art gallery, Manama, Bahrain, 2015- The Mirage II, Al-Masar Art Gallery, Cairo, Egypt, 2013- The Mirage I, Al-Bareh art gallery, retrospective (painting and mixed media), Manama, Bahrain, 2010- Ekhnaton Gallery, Cairo, Egypt, 2004- Espace-Karim Francis, Cairo, Egypt, 2001; El-Gezira Art Center, Cairo, 1999.- Tour Haus Gallery, Münster, Germany, 1995; AWO Gallery, Duisburg, Germany,1994 – DAAD Gallery, Cairo, Egypt, 1993 – La Part du Sable Gallery, Cairo, Egypt,1989 – ACS-Gallery, Zurich, Switzerland, 1988.